I’ve just bought a new computer and am in the process of setting it up. It’s a PC running Windows 7. Windows 7 doesn’t come with an email program installed, but it prompts you to download a package of free ‘essentials’. I wanted to get my email up and running quickly and was going to install just the email ‘essential’ program, but saw the blog writer program and decided to have a look. Until now, I’ve only ever used the Blogger interface when writing up blog posts – or done my writing elsewhere and then cut and pasted. I was aware that there are desktop blogging packages around but had never looked into them. I am writing this as I explore and click on different options. This particular package has a number of handy features not available in the blogger interface for those of us who can’t be bothered to learn html. Such as subscripts1 and superscripts2 and tables. I could see myself using superscripts if I wanted to get all footnotey. There have also been times when I would have added a table if I had been able to do so quickly. Oh look - emoticons. Are emoticons ‘me’? Nah, I don’t think so. There’s a button for adding maps. Here is a map which shows Bung Bong where my Bennett family lived for a time and Amherst where they went to hospital. The maps don’t have many customisation options. I don’t like that the scale has to be in miles. Australia went metric before I was born so miles takes a bit of extra effort for me to interpret. There are extra options when you add a hyperlink to another post, for example you can set the software to automatically add a hyperlink the first time a particular term appears in a post. I tried it with Trove and it worked fine. It’s also easy to link to one of your own previous posts as the software will give you a drop down list to choose from. I’m really starting to like this! Do you use the interface in your blogging platform, or some other software to blog? What software do you use? I’d be interested to know what other bloggers do. With all the excitement of Australia Day and my DNA results coming in, plus my son starting school and my daughter having an adenotonsillectomy a few days ago, I haven't had a chance to report on my findings from my first ever FHL microfilm loan - the Amherst Hospital In-patient's Register (Victoria, Australia). I knew from an index of the register that there were nine records of interest to me. Four of these related to my French/Tregonning branches, which I keep on saying are my current focus. It was these records that prompted me to order the film. My great granduncle William Tregonning was admitted on 30 June 1871 with a fracture of the middle third of his femur. He was discharged, cured, 111 days later. My great grandfather's first wife Marget [Mary] Ann French [Charlesworth] was admitted to hospital from 1 February 1881 to 12 February 1881 with pneumonia. She was cured. My great-great grandfather James William French was admitted to hospital from 22 February 1881 to 27 June 1881 with chronic pneumonia. At discharge he was relieved, rather than cured. My great grandmother Elizabeth Tregonning was admitted from 8 January 1888 to 22 April 1888 with anteflexion cervical ???. She was cured. I can't work out the final word(s) of Elizabeth Tregonning's reason for admission. Can you help? I would like to know what it was. It seems to be some sort of problem with a tilted uterus and given the timing I would very much like to know the nature of this problem. At this stage, she was married to Joseph Tregonning (not related, as far as I know) but it seems the family had fallen on hard times. I am trying to determine if Joseph Tregonning was insolvent in 1887, and went to gaol shortly after. A Joseph Tregonning fitting his description did. Certainly the problem that hospitalised her did not cause Elizabeth infertility, as she bore five more children. Many of the hospital stays were very long. I wondered how the hospital was funded and what the conditions were like. I've discovered that there is a book describing the history of the hospital at the National Library of Australia, so reading that is now on my list of things to do. My great grandfather Henry Michael Bennett was admitted to hospital aged 6 on 7 May 1871. He left 40 days later on 15 June 1871, cured. He had injured his elbow joint in an accident. Henry Michael Bennett was admitted again at age 12 on 20 March 1877 with a contused wound. He was discharged, cured, on April 24. My great grandaunt Elizabeth Bennett was admitted on 18 January 1883 with cephalagia. At just 20 years of age she had been suffering a headache for two years. The register indicates that she was discharged, cured, on 11 March 1883. I hope she was. My great-great grandfather James Bennett was admitted 22 February 1883 and discharged, cured, on 1 April 1883. He had been treated for a fracture caused by a horse kick. Elizabeth Bennett was admitted again on 9 July 1883 and discharged, cured, on 22 August 1883. I haven't worked out the cause of her admission. I am having trouble reading a few of the entries here. Can you make out the first word? I'm also having trouble with the comments on his case. Something about the acute inflammation being relieved, but his arm is bent at a right angle and immobile. What was Elizabeth Bennett admitted with, in her second admission of 1883? Any help on making out he words would be appreciated. That's all very interesting, and in some cases may be even more so when I learn more about what was going on in their lives at the time. The best bit was that the "relatives" column showed names of parents, even for adults. At long last, I have evidence that my great-great grandfather James Bennett's parents were Michael Job Bennett and Mary Ann Barnes. I'd had my eye on the baptism record for that particular family group for some time so it's great to find that it really is him. I consider my first foray into FHL films a huge success! My next FHL film is another hospital admission record. There are only one or two entries in the index for that register that may be of interest to me, but if I have the right people... if all the columns are filled... I may solve another little mystery. As usual, if you have a connection to any of the people mentioned please get in touch with me via comments or the email address on my "About Me" page. I'd love to hear from you. According to some Ancestry.com trees, I couldn't possibly exist. I have seen at least a dozen Ancestry trees that show my grandfather married to the wrong woman. Right time, right place, right name, wrong parents. There are also many Ancestry trees that kill off my great-great-grandfather in his teens, well before he had any children. From time to time I send off notes advising of the errors, or questioning the findings. These are mostly ignored. It really doesn't worry me - I know that I am here. I suppose it depends on how you think of an Ancestry tree. I think of mine as a working tool, not a finished product and certainly not a publication. I uploaded a GEDCOM file quite some time ago. Before uploading it I stripped of the source citations (which experimentation showed didn't import well) and pruned back those dangling branches of descendants so that I wouldn't accidentally include information on living people. Since then, my main database has grown and changed. It holds a lot of new and corrected information that is not reflected in my Ancestry tree. I have no plans toupdate my Ancestry tree - far too much work - and there is no way to synchronise the information with my desktop database. I don't want to remove the tree and start from scratch because I have attached too many records. Those records are valuable to me because I can see who else is currently researching those families through Member Connect. In short, my tree isn't perfect and I have no plans to do anything about it. At present I have my tree set to private. I'm not sure why I've been so coy about sharing. If someone copies chunks of my research - so what? There is little more there than the information I've found on Ancestry. I have much more information in my main database, and still more thoughts in my head about interpretation of that information. So, I am thinking of setting my tree to public in the hope of having more contact from other researchers. Some of my correct information may even gradually replace the incorrect information in other trees. Well... you never know. What do you think? What do you do? Would you judge me by my Ancestry.com tree? Today is my little boy's first day of school. Time goes by so quickly. It seems like yesterday he was a baby and yet when I look his baby photos I can hardly remember that he was ever so tiny. His younger sister is catching up fast. I have decided not to post pictures of my children on this site, but I couldn't let the day go past without doing something. 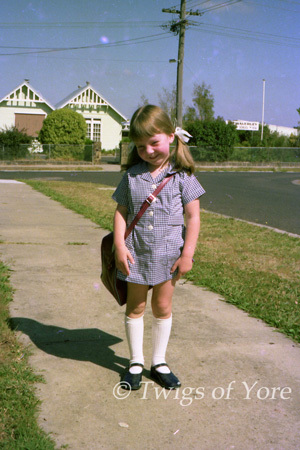 In keeping with the genealogical nature of this blog, here is a picture of his most recent maternal ancestor, standing across the road from school on her first(?) day. About six weeks ago I provided a saliva sample to DNA testing company 23andMe after purchasing a kit on sale. Along with many others, my results have now come in. This post continues the discussion in my previous post. Bear in mind that I have a whole week of experience in looking at this stuff, so anything I say is very much the first impressions of a newbie! If I have something wrong, please correct me. I'm thinking aloud here and I don't intend to claim any expertise on this subject (at this time) whatsoever. The Ancestry Finder is tucked away in Ancestry Labs. It's more useful that it seems at first glance. The blurb says that Ancestry Finder will help you find out which countries your Ancestors may have lived in, fueled by the "Where are you from?" survey - which I recommend that genealogists on 23andMe should complete so that they will appear in Ancestry Finder. There is a link to the survey on the Ancestry Finder page, if you haven't seen it elsewhere. The default view looks at the countries that your matches have said all four grandparents come from, and colour codes a chromosome chart at the appropriate location. Matches who haven't completed the "Where are you from?" survey aren't included. It's hard to get excited about this view. A relative who matches with me on chromosome one had four Norwegian grandparents. I've no Norwegian family connections that I'm aware of, but our common ancestor may have been (probably was) a very long time ago. There is also a match on my X chromosome with someone whose four grandparents are from Ireland. This not unexpected. Each of my parents' maternal lines have Irish connections. The view gets more interesting when you start to use the 'advanced' controls. The first setting I changed was the threshold for showing matches. I reduced it to the minimum allowed. Now more matches show up. Scrolling the upper box I can see that in addition to matches with all four grandparents from the UK, Ireland, Italy, Germany, Poland, Norway and the Netherlands, I also have matches with grandparents from Iran, India, Iceland, Greece and Belgium. Now I find that 17.9% of my genome (that part of it that is analysed by 23andMe) is known to be duplicated in distant relatives across the USA. If I allow matches with grandparents from different or unknown countries I find that the display gets busier still, and that well over a third of my genome is duplicated elsewhere - and this is just from the people who have tested with 23andMe and completed the "Where are you from?" survey! Suddenly I feel rather less unique! The display is interactive. If I click or hover over a country in the legend the chart below will show only that country. If I hover over a coloured patch on the chart a box will pop up showing me the countries represented and the length of the match, in centimorgans. The pop up box in the image above relates to the uppermost match on my X chromosome. If the match happens to be a 'public' match, the pop up box includes their name, photo, and a link to their 23andMe profile. I imagine this would be very helpful if you are working on a theory involving a particular segment of DNA and you just want to be able to contact your matches at that location without having to send out 100's of introduction messages at the rate of 5 per day, and hope! Another feature is the button that allows you to download a CSV file of your Ancestry finder match data. It includes names of public matches. Other matches are "Anonymous" with a number identifier. The file includes the start and endpoints of each match, so it's easy to sort by chromosome and start (or end) point and see where overlaps and clusters are. Here's an example line from the file. The location shown happens to be a "hot spot" where I have 33 very similar matches in Ancestry Finder. One of the people I have made contact with is in this "hot spot" and has directed me to some further reading on the subject - but at one week into the DNA journey it's a bit over my head. Perhaps by the time I'm ready to take it in someone will have worked out what it all means. While the Ancestry Finder download is useful, it doesn't include all the information that the Relative Finder does - such as predicted relationship and a list of surnames once you've made contact. The downloads from the two "Finders" also have different sets of people in them. Ancestry Finder includes more distant matches, but only identifies "public" individuals who have taken the appropriate survey. Not all Relative Finder contacts will have necessarily done the survey and you won't see their name, even if you are sharing genomes, if they are not "public". You can find the match data for contacts you are sharing with, but you have to get the information for then one at a time. The inability to just get the data that you have access one way or another in a combined format is not bothering me too much yet, but I'm sure it will. I've also sent off a kit to Family Tree DNA and will be very interested to see what I get back from them.